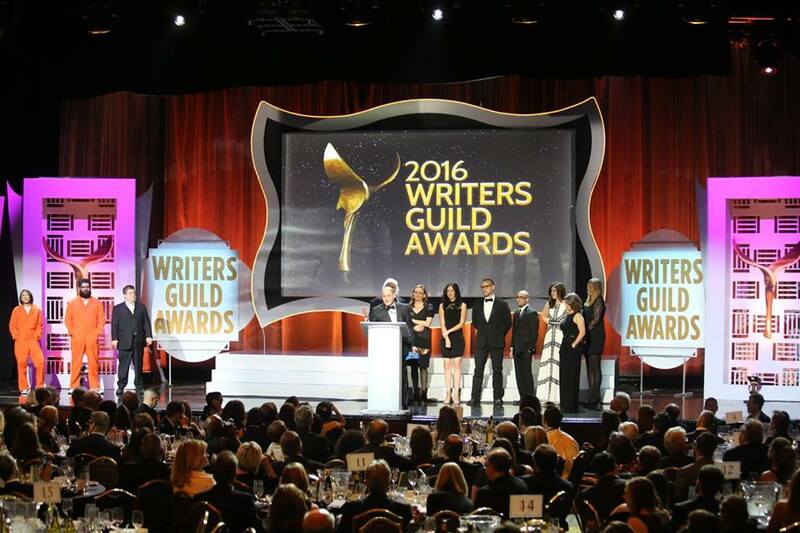 LOS ANGELES (FNN NEWS) - 2016 Writers Guild Awards Winners Announced For LA and NY. Photo: Willie David/Florida National News. LOS ANGELES and NEW YORK (FNN NEWS) – The Writers Guild of America, West (WGAW) and the Writers Guild of America, East (WGAE) tonight announced the winners of the 2016 Writers Guild Awards for outstanding achievement in writing for film, television, new media, video games, news, radio, promotional, and graphic animation categories at concurrent ceremonies at the Hyatt Regency Century Plaza in Los Angeles and the Edison Ballroom in New York City. The Writers Guild of America, West presented several special honors during its ceremony: Friends co-stars Matt LeBlanc (Episodes) and Courteney Cox (Cougar Town) presented the WGAW’s Paddy Chayefsky Laurel Award for Television Writing Achievement to Friends Co-Creators Marta Kauffman (Grace and Frankie) & David Crane (Episodes); Emmy-winning Lost Co-Creator/WGA-nominated The Leftovers Co-Creator Damon Lindelof presented the Guild’s Valentine Davies Award to screenwriter John August (Big Fish, Charlie and the Chocolate Factory) for his humanitarian efforts and civic service; Jaws screenwriter/Emmy-winning TV writer Carl Gottlieb presented the WGAW’s Morgan Cox Award to Emmy-nominated writer Arthur Sellers (Meet the Raisins!) for his Guild service; Oscar and WGA-winning screenwriter Robert Towne (Chinatown, Mad Men) presented the WGAW’s Screen Laurel Award for Screenwriting Achievement to Academy Award-nominated and WGA-winning screenwriter-director-actress Elaine May (Primary Colors, Heaven Can Wait); and Academy Award-nominated actress and Trumbo co-star Diane Lane presented the WGAW’s Paul Selvin Award to screenwriter John McNamara for his screenplay, Trumbo, which chronicles the turbulent life and career of Blacklisted screenwriter Dalton Trumbo, embodying the spirit of constitutional rights and civil liberties. Attendees at the WGAE’s awards ceremony also included Tom McCarthy (Spotlight), Alex Gibney (Going Clear), Beau Willimon (House of Cards), Adepero Oduye (The Big Short), Tony Gilroy (Michael Clayton), Adam Rapp (Flesh & Bone), David Simon (Show Me A Hero), Fred Armisen (Portlandia), Taylor Hackford (Ray), John Markus (The Cosby Show), Marin Ireland (The Slap), Gina Gionfriddo (Becky Shaw), The Black List’s Franklin Leonard and the Commissioner of the Mayor’s Office of Media and Entertainment Julie Menin.